Research your destination-When planning what to pack for your trip, first consider your destination’s weather, what you will be doing when you are there, and if your lodging has laundry available to help you narrow down what to bring. Plan your outfits– After you have determined what types of clothes to pack, plan your outfits out from head to toe to keep from over packing. When picking out outfits, stick to neutrals and items that can serve multiple purposes. For example, a jean shirt can be worn during the day with leggings, over a swim suit as a cover-up on the beach, or as a crop-top over a dress. Keep in mind that accessories can enhance your outfits; so instead of bringing multiples tops and bottoms, spice-up your outfits with jewelry, belts, and scarfs. 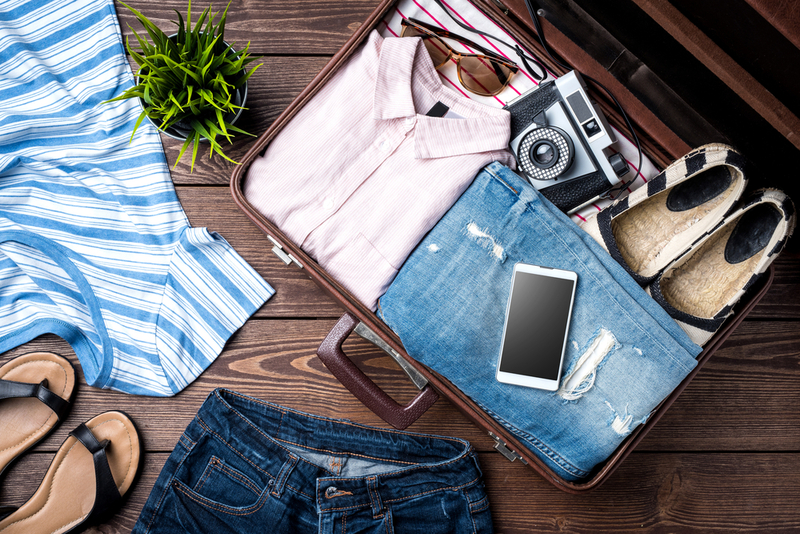 Once you have picked out what clothes you are bringing, roll your clothes to increase space in your suitcase and to keep your clothes from creasing. To properly roll shirts, fold back the sleeves and then roll from the bottom up. 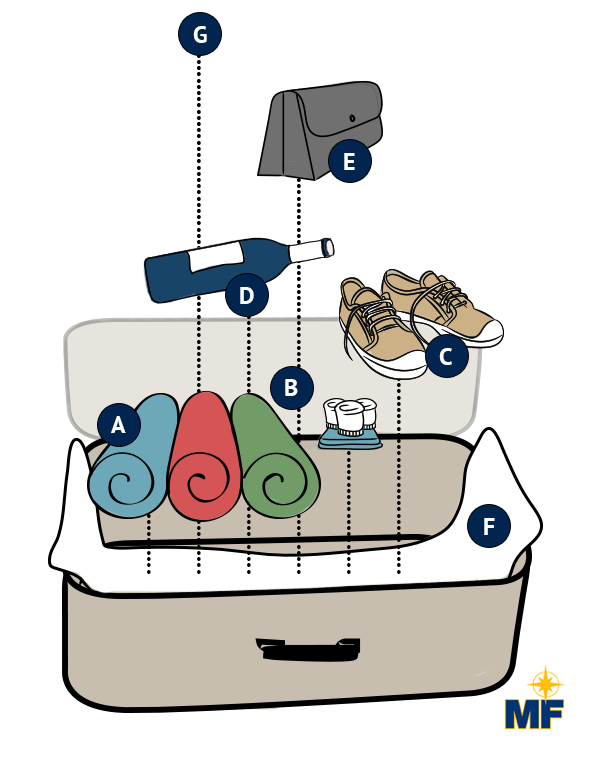 Once all your clothes are rolled, pack your heaviest and bulkiest rolled clothes on the bottom of your suitcase and then pack your lighter rolled items towards the top. Put your socks and undergarments in plastic bags and then tuck them into your shoes or the corners of your suitcase to save space. When packing your shoes, first place them in plastic bags or shower caps to prevent them from tracking dirt on your clothes. Also pack them on the bottom perimeter of your suitcase near the wheels, along with other heavier items, to evenly distribute the weight of your bag. This will prevent your suitcase from toppling over when standing upright. When packing, make sure to place any fragile items including electronics, glass bottles, etc. inside of your bulkiest items such as sweaters and jackets. This will prevent them from getting damaged throughout your trip. Even if you place your toiletries in a sealed plastic bag, there is a chance your bag could open and your products could explode all over your clothes. In order to prevent this from happening, use tape to seal the tops of your bags and double-seal them in an extra plastic bag for additional protection. Pack extra gallon-size Ziploc bags as well in case one of your bags rip during your trip. To prevent your clothes from wrinkling, line the top and bottom of your suitcase with plastic trash bags. This will also prevent water from seeping into your suitcase, and these bags can be used to separate dirty clothes from clean clothes. If traveling by plane, it is extremely important to place your toiletries and important documentation on the top of your suitcase where it can be easily accessible. Planning your next family vacation? Check out these affordable spring break destinations the entire family will enjoy!